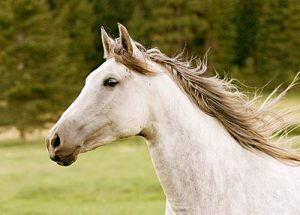 The Andalusian is one of the great, ancient breeds of horse. It originated in the Iberian Peninsula and is named for the region of Spain called Andalucia though the breed actually was more widespread. The Andalusian horse has been documented throughout European history and was praised as the finest horse of war by the Romans and Greeks in ancient times. It’s history as a equine type goes back even further, documented by cave paintings believed to be 20,000 years old. It has been known by many names throughout history but has always been spoken of with respect for its uncanny agility, courage, presence, tractability and beauty. In modern times the name Andalusian means different things to different people. To some it refers only to horses born in the province of Andalucia in Spain, to others it means only horses from Spain. But the IALHA chooses to use the oldest definition which encompasses the breed that originated in the area, including both Spain and Portugal, since at the earliest documented times of the breed's origin and use of that name, neither Spain nor Portugal existed as they are now. The origin of the name Andalucia is believed to have come from one of the peoples, the Vandals, who lived for a while in the Iberian Peninsula. Vandalus means Land of the Vandals. At various times the map of the region called Andalucia has changed. Through most of history, the land now encompassing Spain and Portugal was a single region divided only by names of sub-regions. Even after the creation of the kingdom of Portugal in the early 12th century, the two countries were often reunited as one under various kings. During the Moorish occupation, an important time in the development of both the Andalusian horse and its relative, the Barb, they called the entire peninsula, Al-Andalus and the excellent warhorse found there the Andalus Horse. So its no wonder they are still referred to as Andalusians today. The horse described by the many peoples who encountered it were impressed by its unique qualities and courage is the horse which we now call the Andalusian, be it from Spain or Portugal. In 1912 the breeders of Spain chose to call the Andalusians (as they were know to most at that time) which would be entered into their new stud book, Pura Raza Española (Pure Spanish Race or Pure Spanish Horse). This was done mainly to appease the breeders from Spanish provinces outside of Andalusia who felt there was an unfair advantage given by the old name to breeders of that region. In the late 1960’s, the Portuguese breeders created their own stud book. They named the horses they choose to put into their registry, Lusitanos, Puro Sangue Lusitano, after the Roman name for the region that is now Portugal, which was an important a center of horse breeding. The Portuguese breeders acquired Spanish stock for their breeding programs, and many of the horses which they registered were also registered in the Spanish stud book. 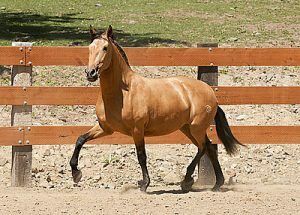 Many breeders were still calling their horses Andalusians well into the last decade and some still refer to this name today. In the mean time, horses had been exported from both Spain and Portugal to North America as Andalusians. The first registries in the USA and Mexico are as old or older than the one in Portugal. Naturally we registered their horses as Andalusians, regardless of whether they originated in Spain or in Portugal. So, today, to understand the Andalusian breed one must also understand the two breeds which are it’s counterparts in Spain and Portugal. 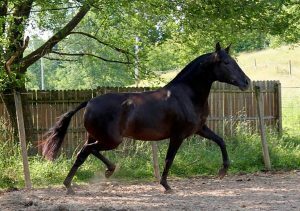 It is not possible to register a Pura Raza Española in Portugal as a Lusitano or a Lusitano in Spain as a Pura Raza Espanola, though many regard the longer part of the history of both breeds as the same horse. The IALHA chooses to therefore breed and register ANDALUSIANS founded from the old breed on horses imported from BOTH Spain and Portugal. Interestingly enough, the two registries in Europe, the Pura Raza Española administered by the Jafatura de Cria Caballar, and the Puro Sangue Lusitano in Portugal, have developed some differences, but the standards of the two are virtually identical. Many of the differences seen today are often more related to individual breeder’s lines than to the entire population in general. Some breeders have selected for specific characteristics, and bred for a specific discipline, such as bullfighting, dressage, cattle work or carriage, resulting in variation of type within the breed standard. In the IALHA, we hope to keep our horses true to type by using the same standard as both the Spanish and Portuguese and even continuing to import horses registered as Pura Raza Espanola or Lusitano to add to our gene pool. Recognizing the importance of keeping all these lines together, we also assist breeders in getting eligible horses inspected by the Spanish or Portuguese for Revision in these stud books. This way we know that a portion of our gene pool remains registered in Spain and Portugal and so we will not drift too far from their standards. The Andalusian Horse is one of the ancient breeds of the world. Its origin in the Iberian Peninsula is documented by cave paintings and even fossil evidence. That horse domestication began very early in the region that is now Spain, Portugal and southern France is evident form ancient sources. These include cave drawings which are dated as being more than 20,000 years old and fossil skulls of horses showing the peculiar wear of the front teeth found in horses which crib (chew and grind at their enclosures) a nervous vice known only to exist in captive, confined horses. Many ancient peoples knew of the horse of the Iberians and praised them in writings, drawings and sculpture. and Romans many times refer to the Iberian Celts as superb horsemen and their horses as exceptional. The Andalusian’s famed ability as a warhorse was to spread and grow with history. The horse became the favored most European kings and generals. By the middle ages the Spanish horse was spread throughout Europe in the every king. The most significant event in the Andalusian’s history occurred in 710-711 AD when the Moors invaded the allies of Spanish Lords who were at odds with their king. Within seven years they had taken possession of Iberian Peninsula and named it Al-Andalus. The important factor to the Andalusian breed was in the horses which the Moors brought with them. Most accounts the cavalry they brought were Berbers with Barb horses and fairly limited in number. The Arab people accounted been brought into battle in Spain were recorded as mainly infantry. So, it was the Barb horse, not the Arabian would have influenced the Iberian horses at this time. However the question is raised did the Barb more influence Andalusian or did the Andalusian more influence the Barb. The truth is probably that both were influenced by least a small way, however we have the written account of, Tarif Aben Taric, a Moorish chronicler of the time that the Moors found the Iberian horses to be bigger and better than their own as well as more numerous. He contemporary scribes (notably: Ben Adhary, Al Makkari, El Doby, El Silerense) wrote that the Moors requisitioned captured Andalusian horses and used them in their ensuing battles converting their infantry into cavalry. This indicate that no great numbers of horses were brought from North Africa and that the Moors found the Andalusian be worth possessing and may have taken them back to their homelands. That the Barb and the Andalusian horse are related either by ancient connection or by mixing during the occupation Iberian Peninsula is evident. The two breeds have many characteristics in common. Both tend to have low set rounded croups with short to medium length backs. Both have well crested, medium length necks. The head does show some oriental influence but is not dished like an Arabian’s head. It is not as truly subconvex as an but tends to be somewhere in between. It is unfortunate that the Barb horse has been so confused with the Arabian with which it has less in common. It is entirely possible that the Barb horse is an ancient admixture of the Iberian the Arab horse as it is geographically found between the cradles of origin of these two breeds. In pre-historic bridge between the Iberian Peninsula and North Africa would have allowed the mixing of these two types into Barb. The modern Barb undoubtedly received further mixing with the Iberian blood during the occupation which explain why it is so like the Andalusian horse. In any case there is no evidence that any significant amount of foreign blood was introduced to the Andalusian Moorish occupation but that what mixing occurred was with the Barb horse NOT the Arabian horse as has been mistakenly written. The Andalusian horse has little in common with the Arabian Horse other than the fact that blooded horses and both have contributed extensively to the development of most other modern horse breeds. With the Andalusian horse so universally admired as a warhorse it was inevitable that other peoples would try own versions using Spanish horses as the foundation. This gave rise to such breeds as the Neapolitan, the Friesian, Kladruber, the Fredricksborg, and many more. All of these horses however had been created by crossing with Horse (from the Forest Horse which gave rise to draft horses and some pony breeds,) a heavy horse possessing shaggy legs with short cannons, broad hooves, a longer, flatter back and short, heavy neck. The Northern Horse powerful animal but not swift and unsuited to the flexibility and collection demanded by the type of maneuvers mounted warfare. The Iberian horse had clean legs with longer cannons and upright compact hooves, a short length back, round croup with low set tail and an upright, flexible, medium length neck. These attributes made purpose and none of the newer breeds could successfully compete with it. It was only when the invention of firearms necessitated the heavy armor for mounted warriors that these heavier horses popular and the European Great Horse was born. These horses to carry the heavy armor of both man and horse into a more version of the art of mounted warfare. No longer was the warhorse required to be nimble and quick like the Andalusian, now it plodding mount capable of little more than a lumbering trot However the uncanny qualities of the Andalusian horse had a new niche. Text on this page courtesy of IALHA.